I have another great raw filling soup for you today. 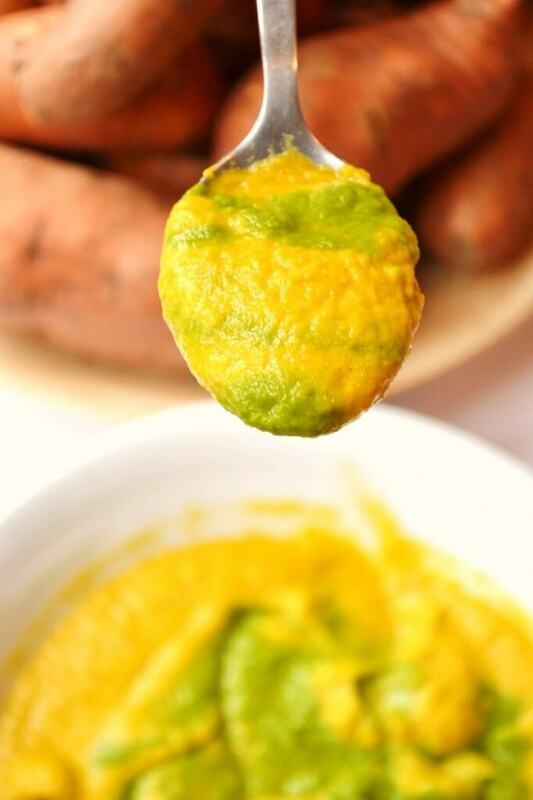 This carrot and sweet potato soup with spinach is absolutely gorgeous and the glowing colour looks really inviting. 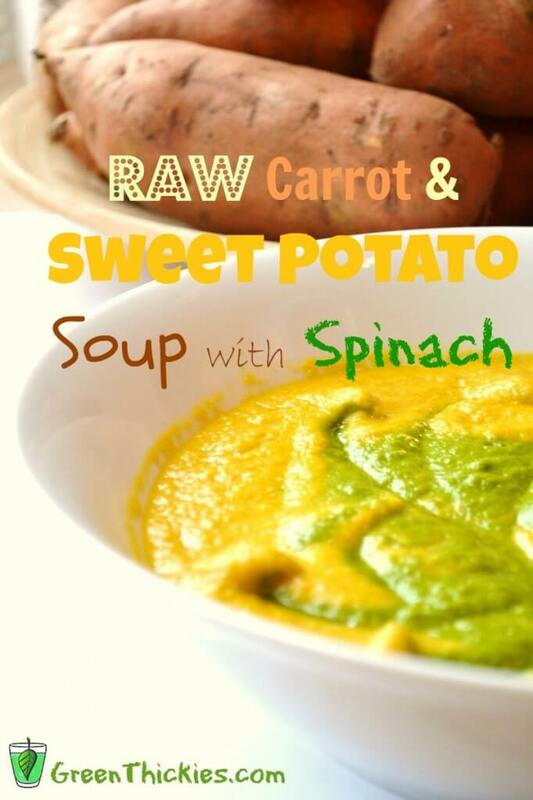 The benefits of raw soup is that you get all the nutrients that are usually cooked away. It also saves so much time as you can just add the ingredients directly to your blender and they taste amazing. 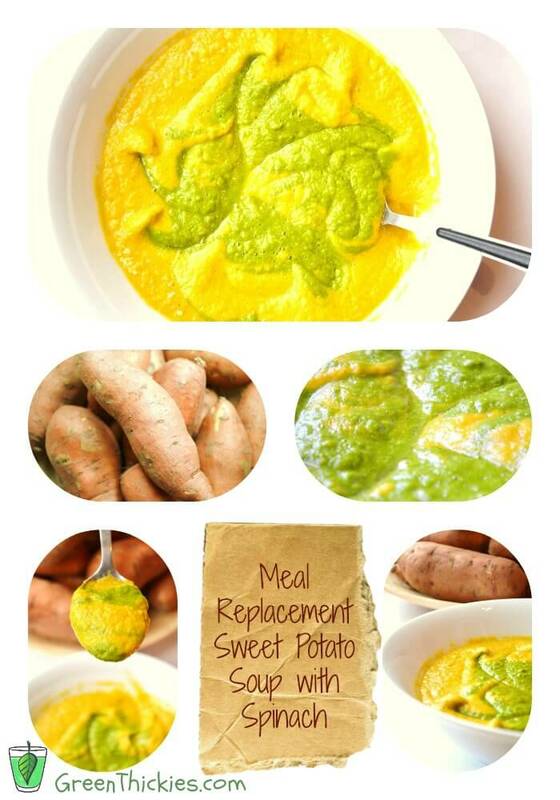 Sweet potatoes are low in fat so they are excellent for people trying to lose weight. They are also much better for you than white potatoes as indicated by the bright orange colour. A lot of sources will tell you that sweet potatoes contain vitamin D which would be great news for vegans if it were true. However chronometer.com tells me there is no vitamin D in sweet potatoes and I trust that as an official dietary source. At this time of year we are prone to Seasonal affective Disorder (SAD) due to the lack of sunlight, especially those who live in northern climates. If you eat a plant based diet, you will have to ensure you are getting enough vitamin D. To do this you can either spend some time outside during the day, get yourself a SAD lightbox, eat dairy free fortified milk or take a Vitamin D supplement to make sure you get enough. 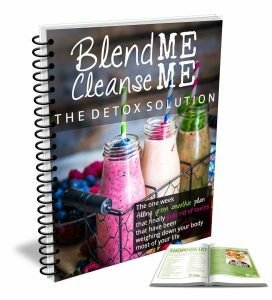 You can let your blender run for a while so the soup heats up but don’t let it get too hot as you wouldn’t want to destroy all of the nutrients. What is a Green Thickie soup? This is a still a ‘Green Thickie’ soup as it’s a meal replacement soup and it’s lovely, thick and filling. 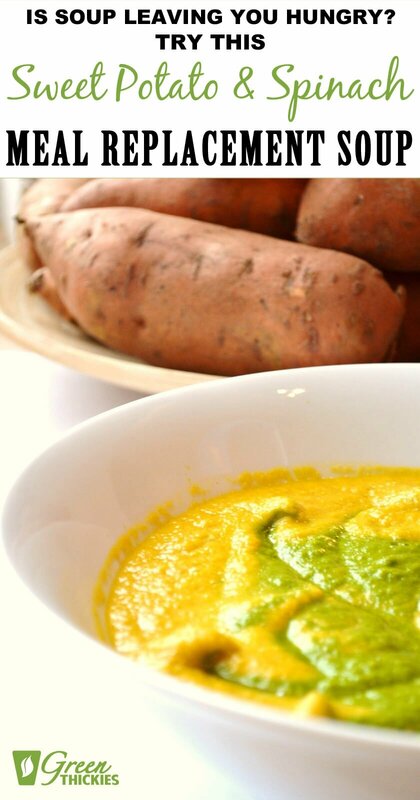 (Along with containing greens) It doesn’t contain oats or any grains though, the carbs come from sweet potato so it’s great for people on a raw food diet. It is a great soup for everyone as it’s full of nutrients and perfect for fall/autumn. This soup is on the lower end of the calorie scale so you may have to eat slightly more than one serving to fill yourself up completely if you’re not having anything else with this soup. This recipe makes 2 servings so you’ve always got the option to have more if you want it. If you hadn’t already noticed, I like to include raw green leafy vegetables in all of my meals (smoothies, soups etc.) as greens are so good for you. 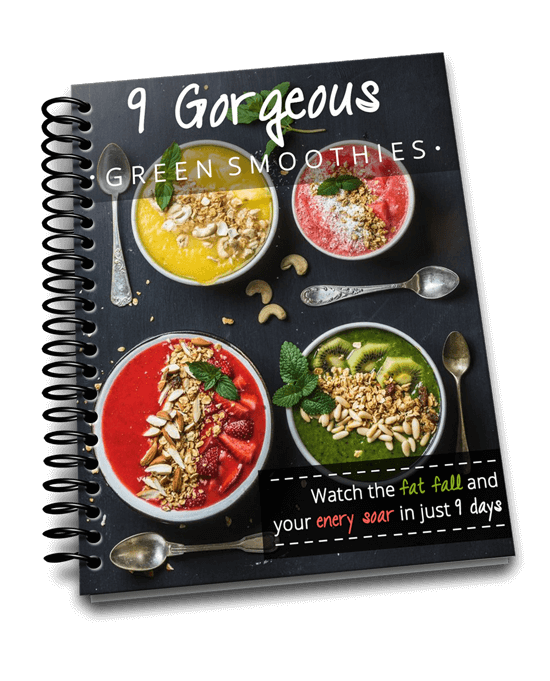 Leafy greens are extremely good at healing the body and giving you energy so that’s why I recommend you try to include RAW greens with every meal, either in the form of a salad, green smoothie, green soup or a green juice. 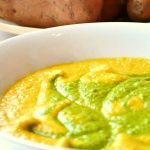 Even though this is a green soup, the colour of the sweet potatoes is too good to hide, so what I ended up doing was creating a sweet potato soup with a swirl of spinach in the middle. So you get the best of both worlds! To do the swirl, I blended up all the ingredients apart from the spinach, poured half of the sweet potato into bowls then blended the remainder of sweet potato with the spinach and poured that on top, swirling it round. 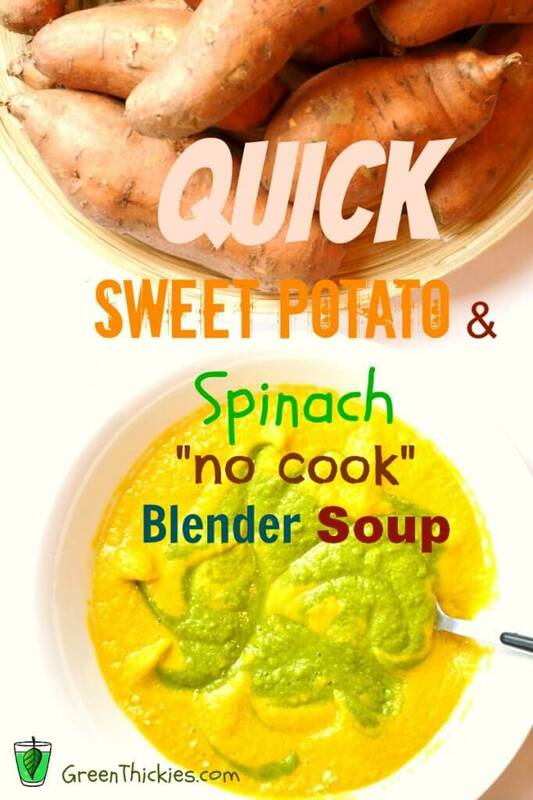 The added benefit of adding the spinach later is that you can run your blender on for a while until it gets warm with the sweet potato in, and then just add your spinach in at the last minute so your spinach will remain uncooked and keep it’s nutrients. This is a lovely eye catching soup is great to serve for guests, and they’ll never know they are eating a healthy raw soup. 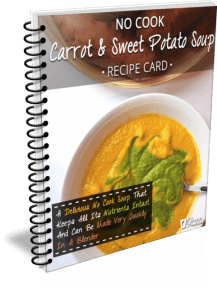 I hope you enjoy this healthy sweet potato soup as much I do. I’m enjoying getting back to my soups now the weather has turned colder. What is your favourite type of soup? 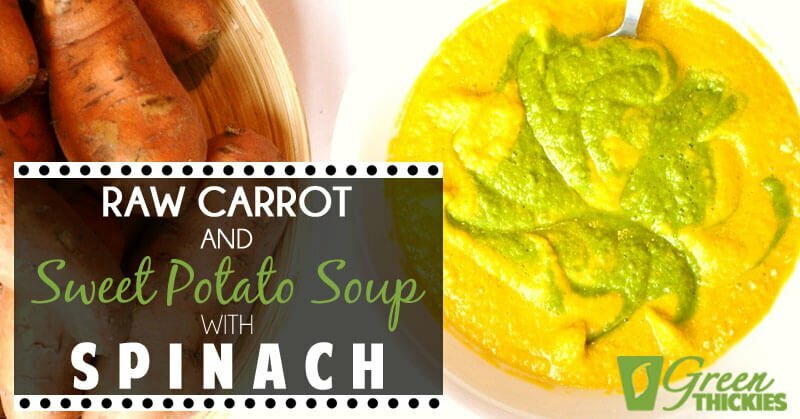 This creamy carrot and sweet potato soup with spinach keeps all it’s nutrients in tact and can be made very quickly in a blender. Blend the ingredients in the order listed apart from the spinach. Blend until it gets warm. Pour half into 2 bowls. Blend the remainder of the soup with the spinach. Pour this into the middle of the bowls and swirl it round. If you don’t have time for a 2 step soup, just blend all the ingredients together. This will make a green soup but it will still taste the same. The calories shown are for half of the ingredients listed as this smoothie serves 2. I have shared this with Wellness Weekends and Healthy Vegan Fridays. Click here to download your FREE PDF of this blog post now. Thank you. I really hope you enjoyed it. That’s great, I’m so glad you liked it Robyn. Thank you for sharing that. Seeds, curry and coconut cream sound like amazing toppings for this soup. Yum! This looks great! We have all the ingredients too. Ill have to see if the family will eat it. If not more for me! Hi Amanda, Thank you. I hope you enjoy it. Thank you for sharing your blog hop with me. I’ve now added it to my regular list. I usually do my blog hopping first thing in the morning (UK) time and submit to blog hops for that day that are live, but if a blog hop isn’t live I sometimes forget to go back to it later. I love the idea of your blog hop and your blog. Thank you. Thank you Gabby. Yes bloglovin does that to me too. I wonder if it’s because my home page isn’t my blog page. I’ve noticed that happening on other blogs too. Sometimes I add the link on blogloving greenthickies/blog and that seems to find more of them, or you are welcome to subscribe and get either a daily digest or a weekly digest. thank you for sharing your post with us at the Wednesday Fresh Foods Link Up! I hope we’ll see you again this week with more amazing seasonal & real food posts. xo, kristy. Thank you. Even thought it’s a beautiful orange colour I still have to get my greens in there, it just doesn’t feel right without them! Thank you Prabha, I really hope you enjoy it! Lovely mix. Great visual idea for the green over orange. We did not have any dates, but used dried cranberry and that was sweet and gave a little chew. We also used kale and that was a little strong. Next time spinach. Thanks! Tastes superb! No avocado on hand, so I used coconut oil. Thank you for sharing. I’m so glad you liked it. Thank you so much for letting me know. Thank you for this recipe! I can’t wait to try it, it’s making me hungry!! I really appreciate the time you put into testing and posting such wonderful ideas. FYI: When you get to the calories it mentions Oats, but I don’t see oats in the list. Well spotted, it shouldn’t contain oats so I’ve edited that. I’m actually looking for soups that I can take to work and heat in the microwave. Would that work with your sweet potato and spinach soup? The point of this soup is that it is raw so I would suggest warming it slightly on the stove but avoiding the microwave if at all possible.